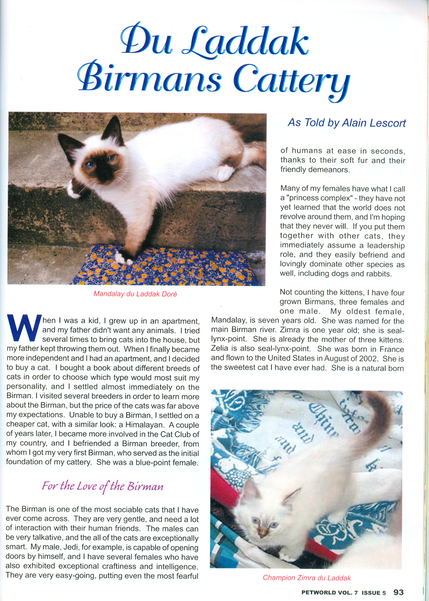 Birmans (or Sacred Cat of Burma) were created in south of France (Nice), circa 1924. They are descendant of Siamese and Persian cats. After WW II, there was only one couple left and breeders had to work again to recreate the breed and solidify it. 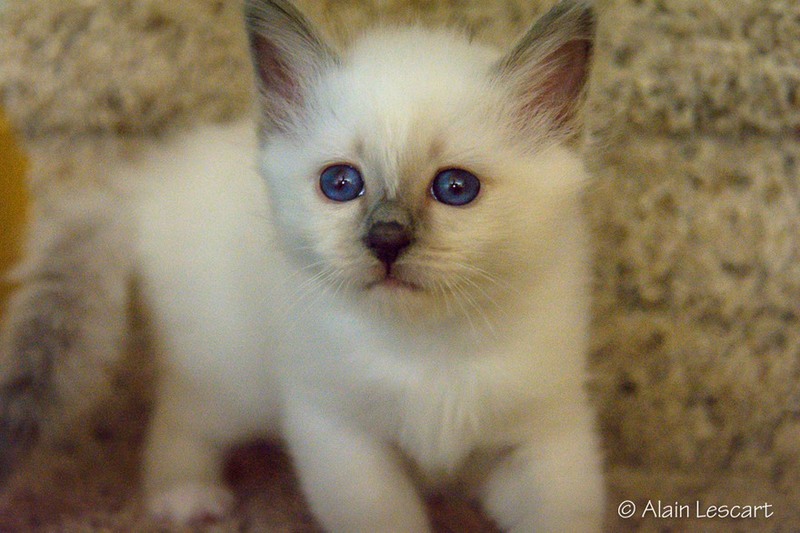 Birmans have white gloves, dark blue eyes, a middle-hair silky coat and a wonderful friendly personality. Originally the only color was seal-point. The blue-point was introduced after WWII in the fifties, sixties. In the seventieths, new colors came from the work of British breeders (using Siamese and Colorpoints)with the chocolate point and the lilac point, and then the red & cream lines were introduced as was the lynx/tabby factor (tiger face) in the eighties. In France the silver and the smoke colors were also created in the ninetieths. More recently, two new colors have been created: the Cinammon and the Fawn. These kittens are in priority for the actual waiting list and then open for others. MARVIN (SEAL-POINT MALE) - Officially reserved for François. 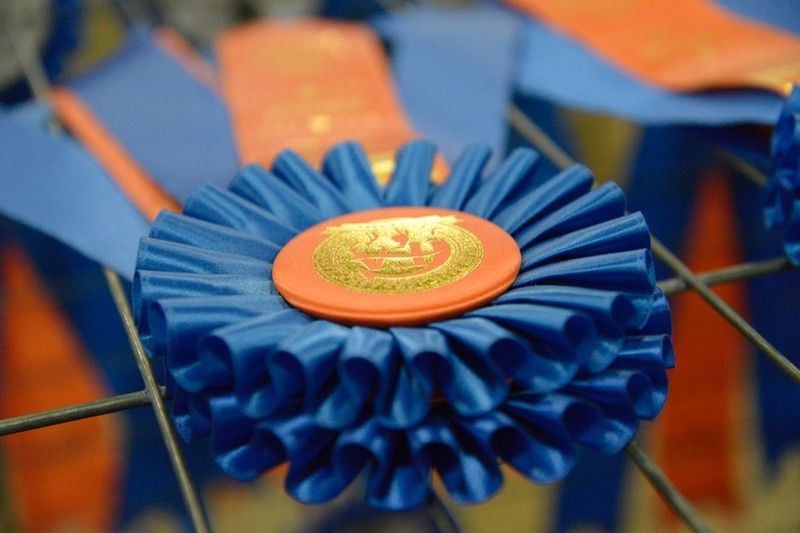 SHOW QUALITY. 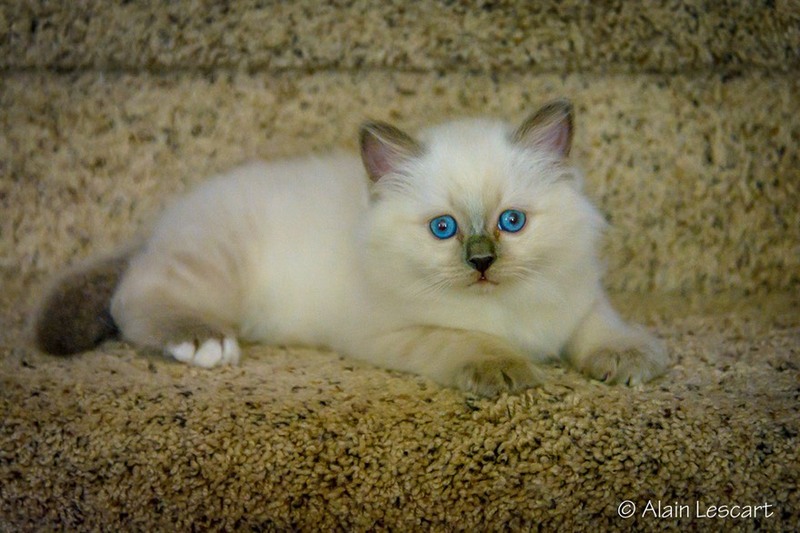 MEMPHIS (BLUE-POINT FEMALE). PET QUALITY. Reserved for Diana. MAYA (SEAL-TORTIEL, FEMELLE): Reserved officially. SHOW QUALITY. Reserved for RhoAnna. MALCOLM (LILAC-POINT, MALE). SHOW QUALITY. Reserved for Nicole. We have a new female since August 2014. It’s a beautiful and wonderful girl named Java du Bleu Nathier. We are in love with her! The first pointed cats were the Siamese. This is why this original discoloration of the body (the warmer part), but the extremities, is also called the siamese gene. The first imported Siamese came from Bangkok, Thailand (Siam), in the 19th century. They were not 100% pure. Left in contact with other Asiatic cats in the streets, they exhibited other genetic traits. They carried a long hair gene that was exhibited from time to time in Siamese’s catteries. Auguste Pavie, consul of France in French Indochina in 1885, described the Siamese has having light blue eyes and some shade of tabby markings on the body. In Thailand, they were called Laotian cats and not Siamese. It is the Europeans that gave that name to this cat. From these incidental long hair Siamese were created the Balinese (a Siamese with long hair), first recognized and bred in the United States in the 1940th. 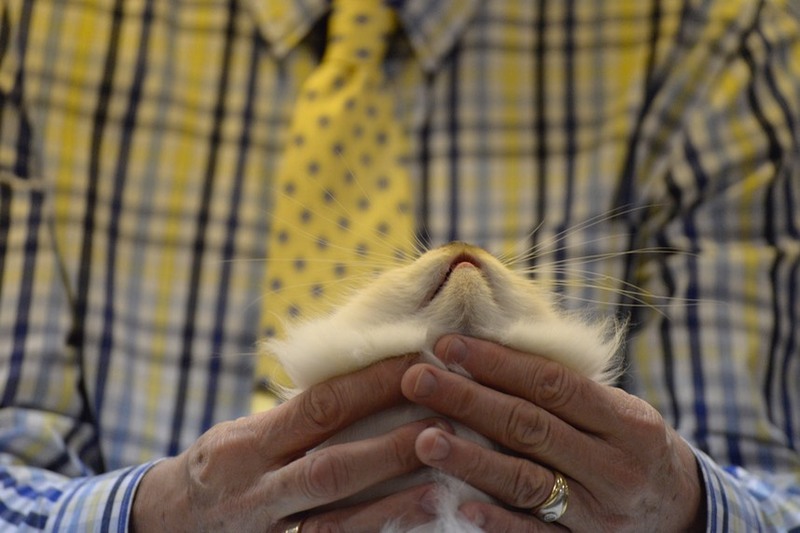 It has the Siamese profile. Today, as the Siamese comes in two forms: the old type Siamese (now called Thai cat or traditional Applehead Siamese) and the modern elongated Siamese, one can find the two types of Balinese with these types, while the Balinese is only recognized under its modern form by TICA. 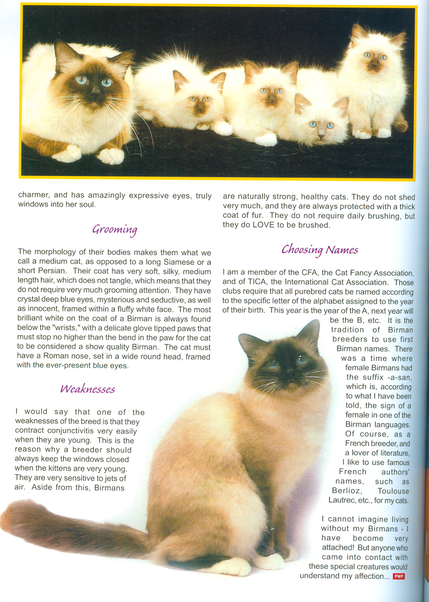 From these incidental long hair Siamese, were also created the Birman cat, aka 1925, with a combination with Persan lines. There is some speculation about the white glove factor. 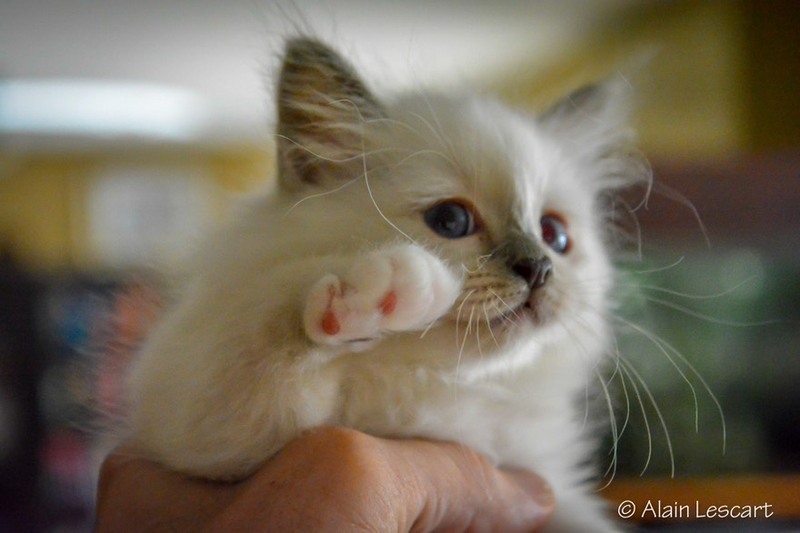 It seems that the first Siamese imported from Thailand also had, from time to time, cats with white gloves; or the person that created the Birman (Mme Leotardi) in South of France used an unknown cat with white gloves. 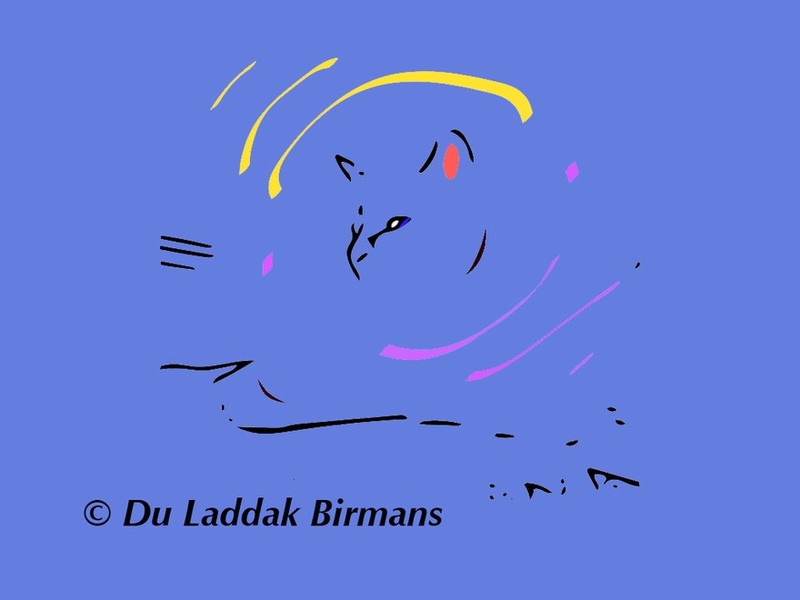 As the Birman’s creation is surrounded with mysteries, we do not know for sure. 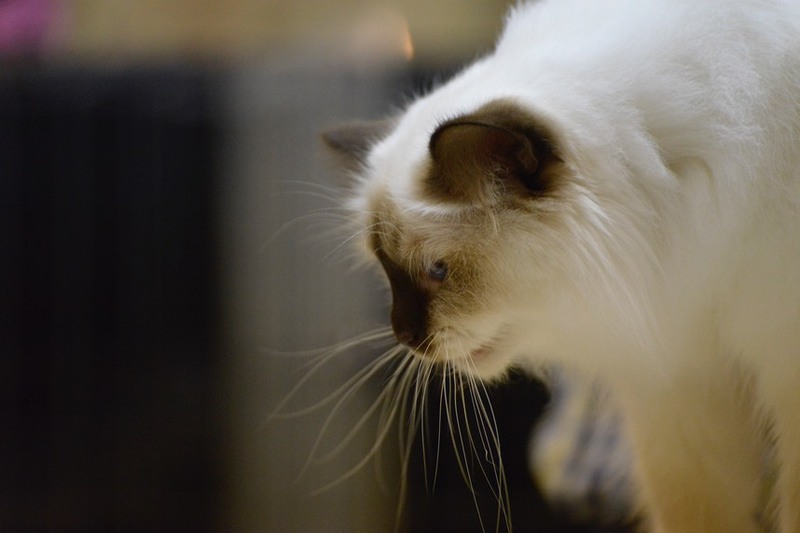 The Birman has a type at the crossroad between a Siamese and a Persan. 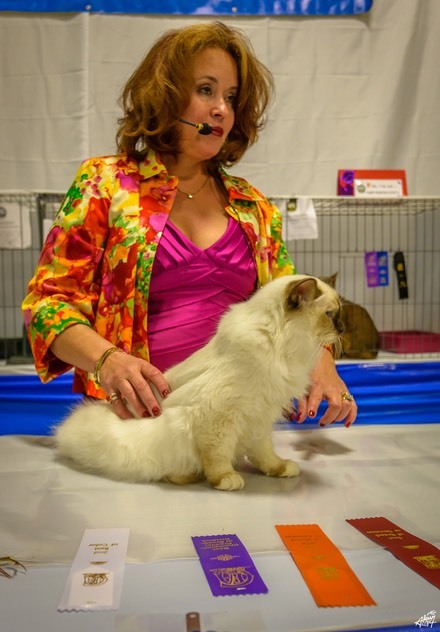 Persan breeders also created, from the Siamese lines, the Persan Colorpoint (first called Khmer cat) in the 1940th. They are also called Himalayan. They have the Persan profile and very light blue eyes today. The Tonkinese is a crossing between a Siamese and a Burmese cat. They have aqua eyes and a mink coat. It was created in the 1960th. 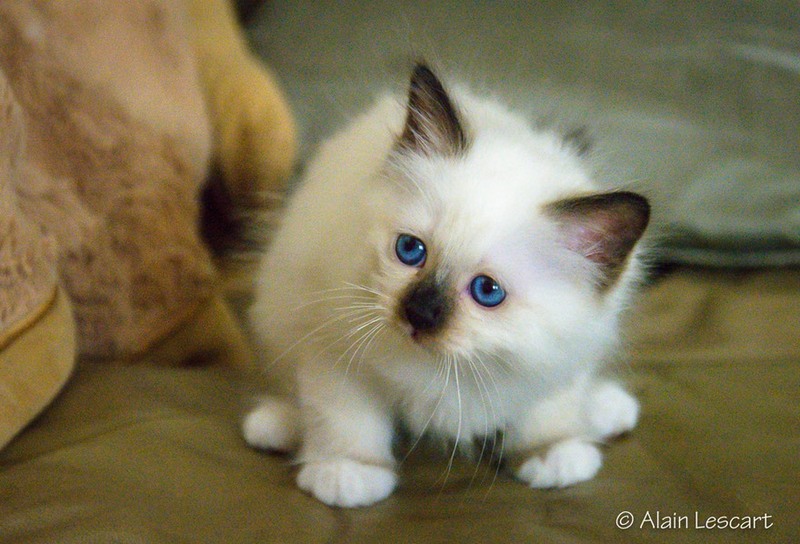 In the 1960th, a Californian breeder created the Ragdoll, using a cat bred with a Birman (as indicated in the first Ragdoll CFA pedigree). 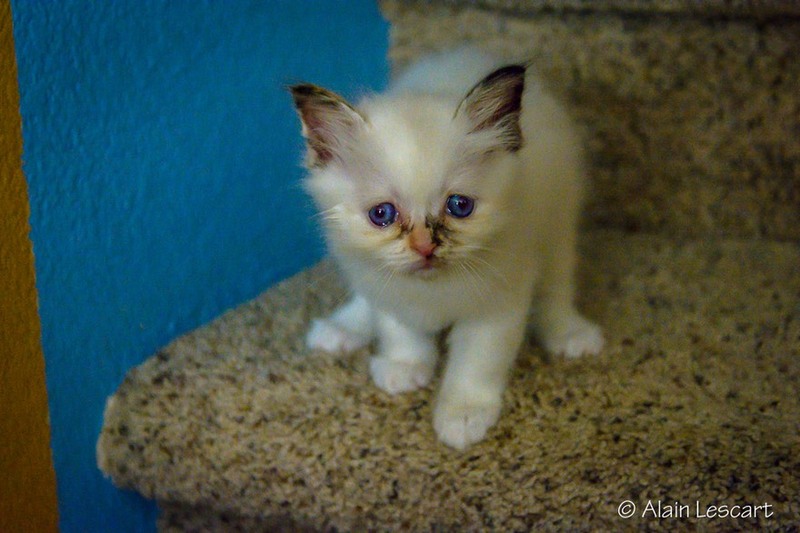 The first Ragdolls were Bicolor, but later on, other breeders used more Birmans to diversify the colorpoint factor. 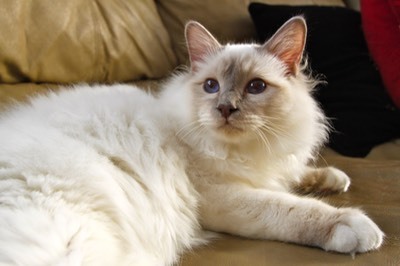 People often mixed up Birmans with Ragdolls as they have become very popular among breeders and easier to breed according to cat clubs’ standards. 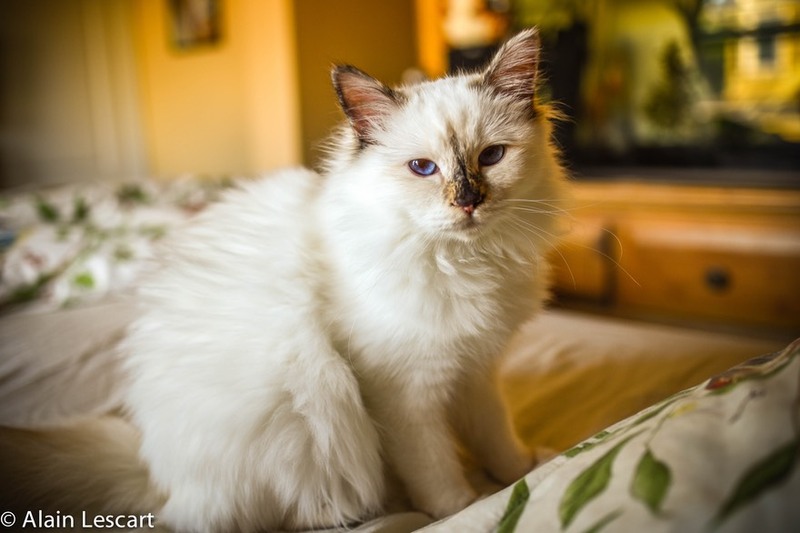 However, the Ragdoll is a far bigger cat and doesn't have the silky, untangle coat of a Birman. The Siberian cat comes now in colorpoint pattern too, since 1997. 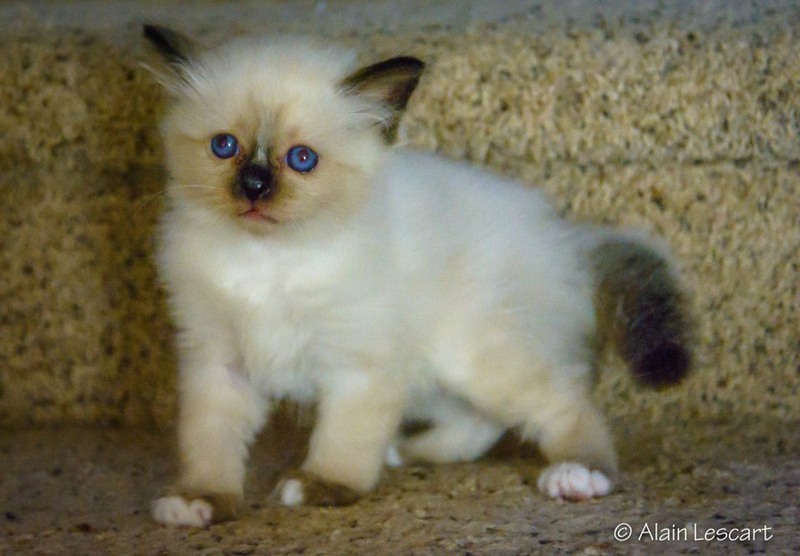 The Lagerfelds Birman Female Blue-Cream Tortie-Point.